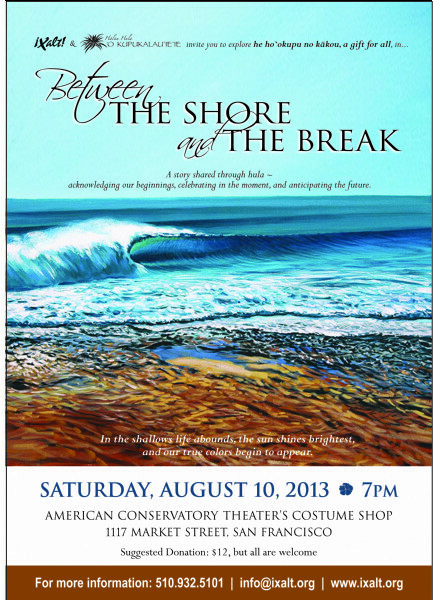 Between The Shore and The Break is a collaborative presentation of mo`olelo (story) conveyed through hula (traditional Hawaiian Dance). Inspired by a `Olelo No`eau (a Hawaiian proverb): " A fisherman of the shallow sea uses only a short line; a fisherman of the deep sea has a long line" (Pukui #725).Thought: A person whose knowledge is shallow does not have much, but he whose knowledge is great, does." Between The Shore and The Break speaks to the process of growing and learning in ones journeys. First: Beginning. Second: Growing. Third: Completing- Arriving at the end of one's journey successfully. Cast: Narrated by Joseph Washington; Choreographed by Kumu Analu Akao; Performed by members of Halau Hula `O Kupukalau`ie`ie. Seating is limited. Advance Reservations are HIGHLY recommended. There are currently 35 seats available.